Last week I featured an electric company, this week it is a plumbing company. 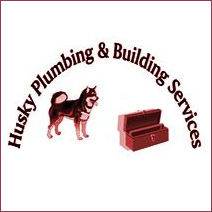 Say woo to Husky Services of Colchester, Essex. I can't think of any breed better suited to the excavation work needed before the pipes go in. I do have 1 quibble, though. The husky looks more like a malamute. I don't know what it would be like to excavate because we don't have a garden, only a terrace but I am sure it will be a good company if it has a husky logo. Wow, I wonder if they would hire me to help with some of their jobs. I'm pretty good at digging extra large husky size holes! I believe your khwuibble is warranted - that surely looks like one of them MalTypeKhanines - they are toooooo big to fit in the tight little spots we Svelte Sibes khan! So Turbo, are you running for Prez? Ari isn't much for putting pipes together, but excavation is her middle name (okay, not really. It's actually Ari Jan, but she wishes it were excavation. or bacon. Any of those -on words, really). Maybe she and Sky boy could start their own business? What say you, Tubey, will you need a subcontractor at the White House? The question is which dog should we elect for president. So many dogs, so little time. We loved seeing the name Essex in your blog. Well, there are stupid humans out there who can't tell the difference ya know. 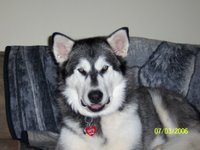 I do believe that is a Malamute!! doesn't do much to promote the intelligence of my (not so) great nation does it? I live in Colchester, Essex! AND we need a plumber! How come I've never herd ov theez fellas?? ?